Busch & Muller the German manufacturer of dynamo power lights has released three new dynamo powered front light models due to come on to the market in late 2012. The models are the Lumotec IQ2 Luxos B 179B (70 lux), Lumotec IQ2 Luxos U 179U (70/90 Lux), and the Lumotec Luxos E 1Q2 179 E (60/140 Lux) (for e-bikes). The other interesting and exciting development with these new Busch & Muller front lights is the inclusion of a USB connection point integrated into the handlebar switch (179U and 179E models only) which allows for charging of mobile devices including mobile phone, GPS units, MP3 players and the like. The lights have a built-in cache battery inside to provide constant charging power. Whilst I do not see the Busch & Muller Lumotec IQ2 Luxos lights replacing my PedalPower+ Super-i-Cable on my Surly Long Haul Trucker but I can see myself installing a Lumotec IQ2 Luxos U 179U (70/90 Lux) on my Kinesis Racelight Granfondo, my commuter bike as I have a long commute (42 km each way) which includes a fair of riding in the dark in the winter months. Having the ability to charge on the go my GPS or phone or camera is a great feature for me in this context. Information in English is a bit limited but going from the translations the following provides some early information on the lights. Real on the bike experience is yet to come. German retailers such as Bike24.net and Starbike.com are listing the lights but at the time of writing do not have stock as yet. Starbike are now suggesting early December, with reports of December 31, 2012. You can register for a stock alert at Starbike.com. As at January 21, 2013 Starbike.com now have stock off the 179B and 179U and Bike24.net of the 179B and 179E. So availability looks like settling down now. Thanks to Starbike.com for the substance of the table. IQ2 Technology introduces a new light and reflector design with a wider (Busch & Muller seem to suggest twice as wide, but not sure what they are comparing against) light beam and a very bright. Some user feedback on the Busch & Muller Lumotec IQ2 Luxos 179B and 179U is starting to come in. At Rose Versand, as at April 3, 2013 there are five user reviews, two on the Luxos 179B and three on the 179U. Four of the reviews are positive and really do not shed much light on the durability issues but a user from Germany, Johannes Bergler has provided a more informative review of the 179U. Whilst he had a few good comments he made a couple of not so good points. The first is that the switch on the handlebar only gives a battery status indication of either fully charged or empty. I must admit this one confuses me a bit as these are dynamo lights, not battery-powered lights and the indicator is meant to show the status of the rear light. It might be a translation issue of course (using Google Translate). If the indicator is of the rear light then on/off sounds right. More importantly is Johannes second concern and the more serious concern: The failure of the Busch & Lumotec IQ2 Luxos 179U in the rain. As I understand it Johannes light failed in the first significant rain that he met. Not a good look at all when you are relying on the light as a safety device. It will be interesting to see if this becomes a recurring pattern or not. One post at YACF UK forums has also reported his 179U just stopping functioning as well and he is waiting for a replacement. HappyHumber at the Australian Cycling Forums received a Busch & Muller Lumotec IQ2 Luxos 179U early April 2013 and included in the packaging was an additional instruction sheet which of course is in German. A Google Translate suggests that Busch & Muller are attempting to respond to issues being raised by providing advice on the setup and use of the light. Busch & Muller 2012-2013 Catalogue [PDF] – Provides reasonable details on the light technology features in the Lumotec IQ2 Luxos. I hope you liked this post! Please do stop by the comment section below and share your thoughts on Busch & Muller Lumotec IQ2 Luxos dynamo lights with the rest of us. Are these the future in dynamo lights? * The images used in this post have been sourced from Busch & Muller. Suspended Bicycle Roundabout – Something for Perth to Consider? I also have a Luxos U and loved it until it failed, incidentally after the first rain (downpour). I live in California and had several month to use the light before it rained and failed. It easily charges my iphone and lets me use its gps without worrying of running out of power. The light has a battery that keeps the LEDs powered when standing still. The handlebar button indicates full battery with a red light. If the battery is only partly charged, the red light is off. It looks like USB devices are only start charging once the red light comes on. Anyway – great light except that not so encouraging failure … Hope it’s an exception and I’m just unlucky. 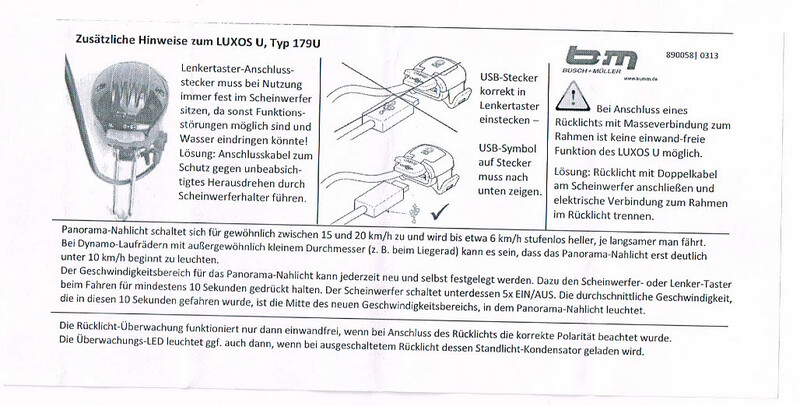 I’m in Melbourne and received a Luxos U a week or so ago from Germany: bad news, it’s already going back. The main problem is that it would randomly switch itself off when I was riding: not good at 7.00pm in the dark. It’s also nowhere near as bright as claimed, in fact compared to my Philips LED or Trelock LS950 it’s pretty much invisible. And the red charging light never came on at all and the “flashing” lights aren’t, that’s a mis-translation – they can be flashed if you hold the button down but don’t blink continuously. What’s worse is that when I contacted the shop they said that they’d had lots of problems with the lights, so didn’t seem surprised that I was returning it. From prior experience with B&M the light will now spend the next year or so being shuttled between Melbourne and Germany, will finally be returned to me whereupon it will fall off my bike, break irretrievably and then get thrown out. SWHS mentions on his blog that B&M had lots of problems with the U: unfortunately I didn’t see his post before I ordered it. I should’ve gone with my other option which was to buy a second LS950, which is an excellent light. Thanks Arapiles for sharing your experience and it is a bummer to read of yet another user having problems. These lights seem to have a lot promise intially with the design so it is really disappointing to read of the growing number of problems. I do hope you get it sorted quickly but. Are you dealing with Bike24.com by any chance? Ah yes lithium batteries. Interesting how I have got them in the mail okay, well posted within Australia so guess that is via road but also that they can go DHL which I assume is air freight anyway. Disappointing to hear that David. There seems to be a pattern forming and Busch & Muller do seem reluctant to recognise it which is also disappointing. Concerning. I also have fenders, despite living in CA and although that should not be a requirement and is not mentioned in the manual – there are much more effective ways to deal with rain from below. I do not have a kangaroo catcher, though. Will install when I visit Australia -:). Can anyone share good experiences with the lamp in the rain? Or is it a dry only affair? Hmmm was really keen on the U until reading this page, looked like a fantastic light ticking all the boxes. May have to try the Edelux after my E3 Pro has died 12 mths in. Seeing all the Luxos U owners post here, I just wanted to post that my Luxos B has failed. It worked great until last night when it failed to light up. Never rode it in the rain. Sorry to hear about your Luxos B Andrew. I had thought that the issues where restricted to the Luxos U models only. I hope you get it sorted okay with Busch & Muller. Please do update us on what happens. I like the idea of the Luxos U for audax riding, where I can charge my Edge 800 and run the lights and never worry about batteries again, but this post along with some other reports I read on the randon group on Google have put me off. It seems like rain is an issue. Also reports on randon suggest that you can’t really run the lights and charge the Garmin at the same time, so if night time exceeds the battery life of the Garmin it will run flat. I don’t ride through a whole 10+ hour night often but I have on occasion. So what are the less integrated alternatives? The PedalPower+ ? Based on my experience with PedalPower+ Super-i-Cable I would be giving one of them a miss and going with the likes of the Busch & Muller e-Werk which by all accounts is more reliable. I bought a IQ2 Luxos U from Peter White Cycles. From day 1 the usb port did not work, but the other functions seemed to work for about a month, then it died on me. I’m sending it back to Peter. I never used it in the rain (Southern California in the summer). Sorry to hear your light has not worked as expected. Like all products there are at times going to be dud ones.